I thought the days of ribbons and spools went away with the virtual extinction of typewriters and film reels, but ribbons and spools are the main focus of the Federal Circuit’s only substantive opinion last week. The ribbons and spools at issue here are part of industrial printers for plastic packaging and other non-ink-friendly surfaces. The machines work much like a standard typewriter, but the print heads are heated to help the ink stick to the surface. One of the problems with these machines is making sure that the ribbon moves continuously and consistently and stays sufficiently taut throughout the printing process. That is the problem that Zipher’s patent addresses. Markem-Imaje’s printers can rotate both spools to adjust tightness, but only one spool turns to make each adjustment. Markem-Imaje asked the district court to rule that its printer did not infringe Zipher’s patent. 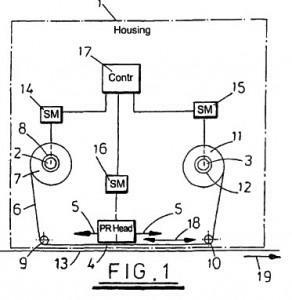 The district court looked at Zipher’s patent claims and said that the term “drive” means “rotate.” In context, the court said that both spools have to rotate together to make adjustments. Based on this construction, the district court concluded that Markem-Imaje’s product did not infringe because only one spool moved at a time. Although the Federal Circuit issued this opinion per curiam, which means no one judge on the panel is listed as the author, Judge Newman did not agree with the short Part II of the decision. In this section, the Federal Circuit considered the district court’s conclusion that the claims needed “some method of deriving a tension measurement”—basically, how the machine determines how tight the ribbon is. The district court said that the printer needs some way to measure the tautness or slackness of the ribbon because the measurement tells the motors when to adjust the spools. The district court looked at the patent’s specification (the part of the patent that describes how the invention works) to support its decision. Zipher argued that the patent claims don’t say anything about measuring the ribbon’s tautness, so the court shouldn’t limit the claims based on the specification. The panel majority agreed with Zipher, but Judge Newman said that the majority’s interpretation “ignores the paramount importance of the specification in claim construction” (See page 1 of Judge Newman’s dissent). Judge Newman said that the specification “shows what the inventor actually invented,” and an inventor can’t ignore the specification to get more than he invented. Judge Newman cited a lot of cases to support her stance, and she found fault with the one case on which the majority relied, determining that it was different based on its facts.